Become a Superstar – it's Mario Sports time! 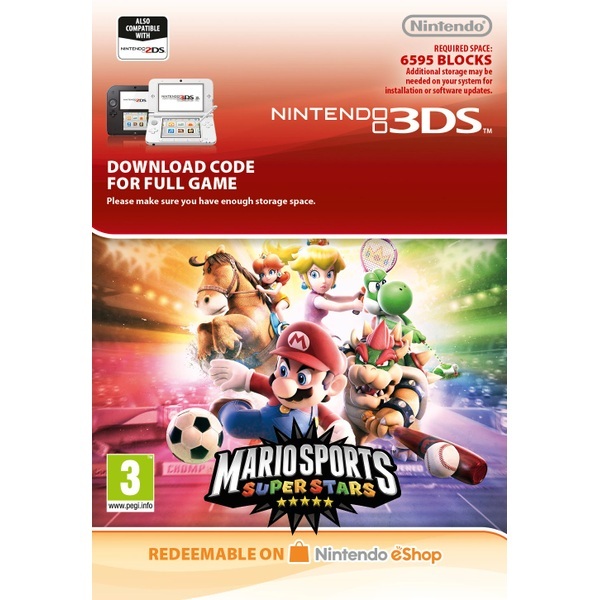 Take to the field with an all-star line-up in Mario Sports Superstars, an action-packed selection of supercharged sports only for Nintendo 3DS family systems. Set your squad of Super Mario favourites on the road to superstardom in five of the world’s most popular sports, and compete with others nearby and online! Five fully-fledged sports Tear up the turf in 11-a-side Football matches, slug it out in Baseball, get on the green in Golf and own the court in Tennis. For something a bit different, saddle up and get ready for some fast-paced Horse Racing! These are full-scale sports, featuring layers of depth, strategy and real-world authenticity. You against the world Each sport features its own in-depth single-player mode with various tournaments to conquer, as well as a number of multiplayer options, so you can duke it out with friends and foes, near or far. Compete via Local Play or take the rivalry online in all five sports! At the topf your game You can up your game with the new range of Mario Sports Superstars amiibo cards (sold separately or as part of a software bundle)! You don’t need amiibo cards to play, but by tapping them in, you can boost your characters’ stats and abilities, and even unlock new gear for them to use. Look out for specially-marked packages at launch, which include one randomly-selected amiibo card! An all-star line-up A number of Mushroom Kingdom favourites are ready to battle it out for supremacy, so you can assemble the ultimate squad! In team sports, pick your squad mates wisely – each character has their own strengths and weaknesses, and a well-balanced team could make all the difference. Practice makes perfect If you’re making your debut in any particular sport, be sure to get familiar with the ins and outs before you head out onto the pitch. Training modes for each sport allow you to get to grips with the basics, then you can hone your skills further in minigames.